A month ago, I attended the Web Developers Conference in Bristol. On Friday, I published my writeup of the conference. The sharp-minded amongst you will have already worked out that it took me just under a month to write a blog post - quite a long time! Why did it take so long? Partly because of work and other commitments, but largely because I spent too much time worrying about it - what words to best get across my intended meaning, what stock images to give the post some visual spice, whether or not anyone cares what I think about the Pomodoro Technique - that kind of thing. The same problem also manifested itself in other ways. For example, I'd sometimes want to chip into a discussion on Twitter but hold back because I didn't want to bug people, or felt that perhaps I'd be out of place butting into a conversation. Worrying about Twitter sounds trivial, but what if you got offered a dream job and had to refuse because you were worried about whether you'd be good enough? I think the root cause of all this is the way my brain works. I'm naturally inclined to analyse things in detail, see how they work and what they can do. I also care a lot about doing things "properly" - taking care of the details, smoothing off rough edges. These qualities make me a natural fit as a designer/developer and help me to produce work that I'm proud of - but they also have a dark side. What makes me produce my best work can also stop me from producing anything at all if I'm not convinced it's my absolute best. Now, that may not sound so bad - after all nobody wants to produce substandard work. But would it really be so terrible if I pushed out my WDC post a bit quicker and didn't take so long choosing the right words? Would anyone have sat there reading it thinking "well, this is OK, but he could have used a better adjective to describe his dinner"? Probably (hopefully!) not. On a larger scale, you might worry that you don't deserve that dream job, that you're not good enough and that the people who offered it to you have made a mistake. Perhaps you feel that your skills are not quite up to the right level, and that you won't be able to raise your game enough. The solution to all this is simply to worry less. Actually, it's not simple at all, particularly if you're of a similar mindset to me and find it hard to break the habit of worrying. Obviously, there are some "small" things that do need attention and we should absolutely continue to care about those. What those are depends on your particular vocation and values - for example a professional copywriter might really need to choose the right word to describe a dinner and likewise if I find myself pondering the virtues of one CSS technique over another, I consider that to be me doing my job properly. One thing that is very important in this process is knowing where your boundaries are. There's a thin line between getting out of your comfort zone and getting totally out of your depth and getting into trouble. A key ingredient in all this is knowing that you have a good support network to help you make decisions. In my example of the dream job, you could talk to people who have similar jobs, or similar areas of expertise. Say that new job needed a certain level of competence with PHP and you weren't sure you fit the bill - do you have a friend who is good with PHP, and could help you out? Are there local meetups where like-minded types get together so you could speak to people there and see what they think? Another, more fundamental part is working out exactly what is important to you - where your true passions lie. Once you know what's important to you, it's much easier to identify what you can stop worrying about. This is often referred to as "finding your authentic self" - sounds a bit happy-clappy-self-helpy I know, but everyone you look up to, everyone who is successful in this world has at some point worked out what they truly wanted and gone for it, leaving anything unimportant by the wayside. A lot of them won't realise it, because they have done it intuitively, but they have all done it. For me - I'm not hugely bothered about being thought of as a master of the English language - I'd rather be building and sharing cool stuff, meeting interesting people and visiting new places. So agonizing over a choice of words isn't getting me anywhere - I'd be far better off just getting my thoughts out there and things can always be clarified later. With the dream job example - if you've worked out what's important to you, and you're not fussed about being the world's greatest PHP programmer but everything else in the job fits your aims exactly, then you can commit yourself to being "good enough" at PHP to do your job, and focus your energies on being awesome at the other aspects. If you can manage to worry less, you should find you are able to do more. All that time and energy you used to spend sweating the small stuff can be put to better use doing stuff that furthers your goals - for example writing more blog posts, learning something new, working on a side project or taking on new clients. The really great thing about a "worry less, do more" approach is the more you do what you love, the better you'll get at it, and the more confident you'll feel. The more confident you feel, the less you'll worry! As so often in life, the first steps are the hardest. You may well still feel fear, but learning to control it rather than letting it control you will become one of your strongest assets. I'm not saying that it's universally easy to adopt this approach - for some people there will be some very tough decisions to make - but it's something we can all do. If everyone manages to worry a little less, and do a little more, who knows what we can achieve? What do you think? Do you have any tips for how to let go of unnecessary worry? I'd love to hear your thoughts in the comments! Main image by Yarik Mishin. 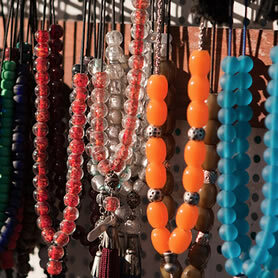 Worry beads photo by Brian Jeffery Beggerly. 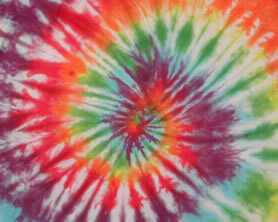 Tie dye photo by Erin Calaway. Posted on Thursday, 24th November 2011. I totally agree that having a support network is vital to moving forward and “manning up” to the challenges ahead. You can be the most talented designer in the world but you’ll always want someone to be there to bounce ideas / concerns off with. Thank you guys - I’m really glad that the post has been useful! It’s so liberating to notice when you’re worrying for no good reason and push on through. Before, I wouldn’t even have published this because I’d be too worried about saying the right thing! Amazing blog, it reminded me of myself prior to the start of this year, I suffer from bad anxiety as it is so I’m constantly worrying over what 99% of people would see as stupid and little things to begin with haha. But this all this rang true. Its kinda nice? knowing ‘established’ designers feel this way too. It’s good to hear that you’re doing something about your anxiety - it would be such a shame if it overpowered your love for what you do. The “Dunning–Kruger effect” hypothesis could perhaps help with a technical explanation. I think everyone has experienced/witnessed it. Ignorance it seems really can be blissful. There is nothing wrong with fear and uncertainty. Fear and uncertainty are parts of the standard human condition. I feel both on a daily basis, sometimes hour by hour. Fear and uncertainty obviously do become a problem when we allow them to overpower us, cripple us, prevent us from doing the things we truly want to do. Uncertainty will always be a part of my life. Always. What I have learned to do is ride it out like a wave. Metaphorically it’s just like surfing. I try not to let uncertainty bring about a wipeout. I’ve trained myself to “hang ten”. I no longer let fear prevent me from doing the things I want to do. Rather, I take fear along with me for the ride. The Dunning-Kruger Effect could well be in play here I agree, a lot of worry seems to stem from comparing ourselves to others and making assumptions which are more than likely incorrect. Absolutely agree with everything you’ve written, fear is not a bad thing in itself, but there is a certain amount we can eliminate by not worrying about important things. The only way we can better ourselves is by trying new things and it’s very rarely going to work out perfectly first time. Putting ourselves at risk of looking stupid or not being good enough is probably one of the most worthwhile things we can do, in my opinion. (forever, most likely) is a commitment to be more "authentic" in all areas of my life. Denise also noted that fear suppresses creativity - if we're worries about getting things wrong, we're not going to create anything. This resonates with me personally due to my attempts to worry less and do more and it's nice to know I'm on the right track.